The Confederates were on their way to capture Washington DC on July 9, 1864 when they were intercepted by Union troops just south of Frederick, Maryland. They fought and the Confederates won the Battle of Monocacy Junction. But the one-day engagement delayed the Confederate march to DC just long enough to give the Union time to reinforced DC’s defenses. The Confederates didn’t get DC and it was the last time they ventured into Union territory. Fun fact: the general who commanded the Union troops at Monocacy, Lew Wallace, later wrote Ben Hur. The battle site is now the Monocacy National Battlefield Park. There were several houses on the battlefield, none open to the public. That never stops me from peeking through the windows to see what I can see. 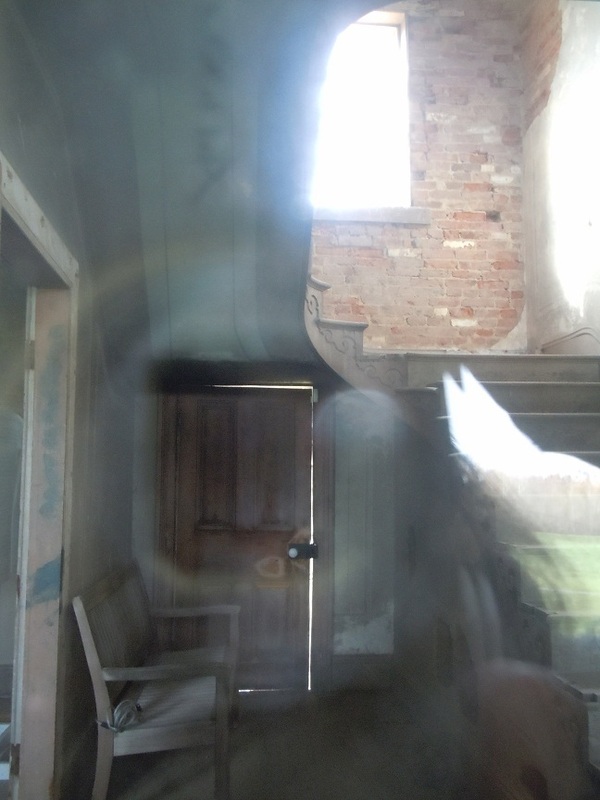 The photo was taken through the window in the door of Worthington House. I love the light through the old glass. Gallery | This entry was posted in Maryland. Bookmark the permalink. If it’s a national park, and the houses aren’t open – what are they doing with them then? Tantalizing people such as our good History Tourist with something so close yet so far? I know! Isn’t it cruel? Some of them are administrative office. Some of them are for hire for special events, like conferences and wedding. I’m guessing that for most of them, the park service doesn’t have enough money or staff to keep them up to code and staff them.